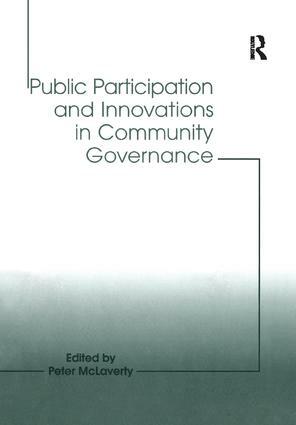 Comprised of a series of national case studies, this book critically examines initiatives in public participation and their relationship to developments in community governance. As such, the case studies enable national perspectives to be applied to crucial features of modern public policy and politics. Focusing on case studies in areas which are undergoing major social and institutional transformation and/or which raise particular issues because of the marginal position of the areas within their nation-states, the book also concerns itself with developments in Western European countries and why people should logically support some but not other initiatives in public participation. This book will be very useful for students and academics in areas such as politics, public administration, social policy and sociology. It should also be of interest to local activists such as councillors, members of pressure groups and those concerned about modern trends in democracy. Contents: Introduction, Peter McLaverty; Overcoming severe obstacles to public participation: indigenous people and impact assessment procedures in Australia, Ciaran O’Faircheallaigh; Public participation and integrated development planning in decentralized local government: a case study of democratic transition in South Africa, Cornie Groenewald and Antoinette Smith; Tlalpan neighbourhood committees: a true participatory option, Arturo Flores; Decentralization and citizen participation in Barcelona, Georgina Blakeley; Metropolitan governance and democracy: how to evaluate new tendencies, Daniel KÃ¼bler and Sonia WÃ¤lti; Decentralization: new forms of public participation or news forms of managerialism?, JohnDiamond; Rediscovering the citizen: new roles for politicians in interactive policy making, Erik-Hans Klijn and Joop F.M. Koopenjan; Neighbourhood councils - municipal instruments or grass-roots movement? some reflections on results from two Norwegian surveys, Nils AarsÃ¦ther, Torill Nyseth and AsbjÃ¸rn RÃ¸iseland; Is public participation a good thing?, Peter McLaverty; Index.